Sainte Mere Eglise and La Fiere are just 15 minutes from our bed & breakfast and holiday vacation rentals. The town made famous by the film “The Longest Day”, is an extremely popular tourist destination; especially for American’s wanting to follow in the footsteps of the Airborne soldiers.andy. 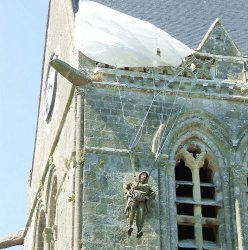 Sainte Mere Eglise witnessed fierce fighting in the early hours of June 6th 1944. This would herald the start of the allied invasion and the battle of Normandy. American paratroopers from the 82nd Airborne Division dropped in and were ordered to capture the town and hold off German counter attacks that could come from Cherbourg. A lot of the surrounding fields had been flooded by the Germans in anticipation of an allied invasion and as a result, numerous American soldiers drowned after dropping into them. Before the invasion started, a building caught fire in the town square and this provided the Americans with an ideal landing beacon. The locals gathered to try and extinguish the fire and as the Americans started to land, chaos ensued. The Germans, completely taken by surprise, started to fight back. Many American Paratroopers landed in precarious locations, making them easy targets for the Germans. The American’s suffered considerable losses in the battle; many paratroopers being killed before even landing. After some fierce fighting, the American’s managed to encircle the town and by dawn, Sainte Mere Eglise was captured and around 30 Germans were taken prisoner. 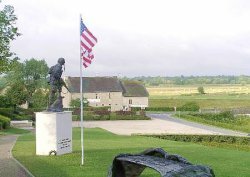 The site of the building that burned down in Sainte Mere Eglise during that fateful night of June 6th 1944, is now home to the American Airborne Museum. This museum houses numerous authentic artifacts from the American Airborne Divisions, so for World War 2 history, it is a must visit! During the month of June, there are many special events in and around the town. In June 2010, there was a combined parachute drop of around 500 soldiers from different countries, including the United States of America, Great Britain, Canada and Germany. A fantastic spectacle in the skies around Sainte Mere Eglise; no doubt bringing back emotional memories for the locals who lived through the actual battles in 1944. 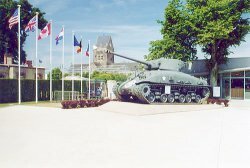 A few kilometres west of Sainte Mere Eglise is La Fière; a strategic location to both the allies and axis forces during World War 2. Most of the area there had been flooded by the Germans and one of the last remaing bridges that could support heavy armour was located here. With the knowledge that the Germans would try and send there tanks over this bridge to counter attack, The Americans were desperate to hold this bridge at all costs. There was a desperate battle at the bridge at La Fière and the Americans managed to repel the German counter attack. There are a lot of guesthouses in and around the town; however, if you have a car, why not stay at Ivy House. Sainte Mere Eglise is a short drive from our B&B and holiday cottages. We also have the added benefit of being located directly behind Utah Beach and are surrounded by World War 2 sites. If you are planning a trip to Normandy to visit the battlefields, beaches and cemeteries of World War 2, we would be happy to welcome you to our lovely home.